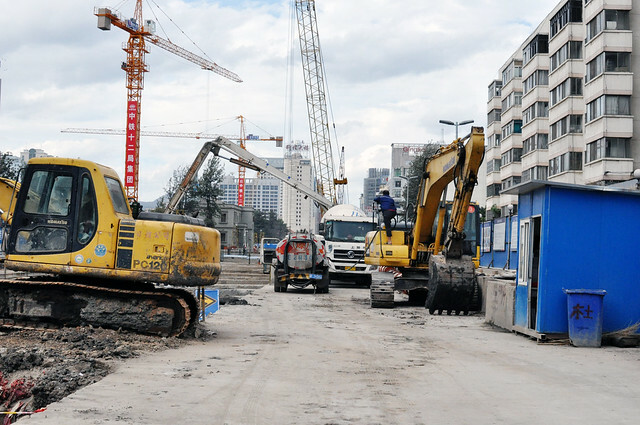 CoLab Radio » Blog Archive » Why Document Kunming's Bike Lanes? 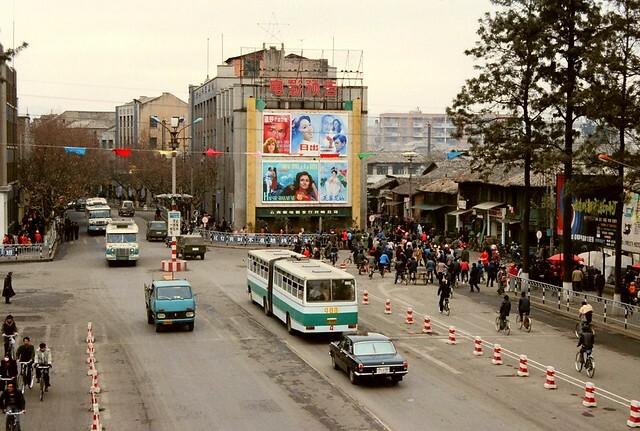 By chance, I discovered these wonderful photographs of Kunming’s center from the 1980s. It’s striking to note the differences, especially on the bike lanes. Kunming, August 1983 taken by Leroy W. Demery, Jr. The old communal houses in the center of town are now largely vacant. On the door and wall is a list of names and contact information of former residents that have moved away. The intersection of Baita Road and Dongfang Road before afternoon rush-hour. Mainland China has about 500 million bicycles, according to the Beijing-based China Bicycle Association. Since the 1949 Cultural Revolution led by Mao Zedong, the Chinese government pushed and endorsed the bicycle industry. Bicycle lanes became part of urban street planning and commuting workers received financial subsidies when purchasing a bicycle. The bicycle ownership became a status symbol, and an embedded part of Chinese culture. The tradition of san zhuan yi xiang, or “three round things and a sound” included four essential items a couple needed to begin a life together: a sewing machine, a watch, a radio, and a bicycle. In those days, Flying Pigeon was the country’s biggest bike builder. In the 1980s, it sold around 4 million bicycles every year. For most of the urban elite, the car has replaced the bicycle as the symbol of affluence. 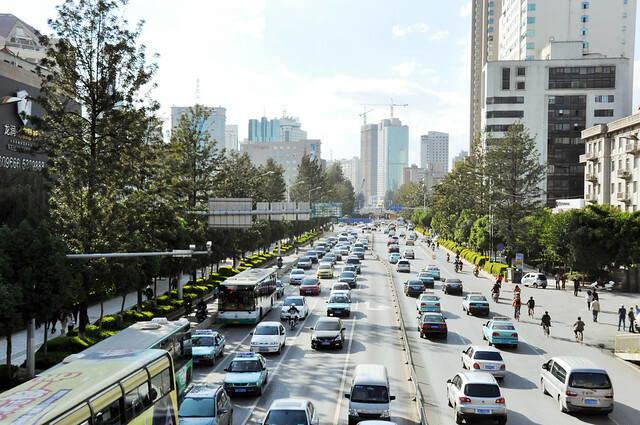 In Kunming, it’s no different; its registered motor vehicles has exceeded 1.3 million, and the city continues to add over 1000 new automobiles daily. Post and select photos by Sewon Chung. Additional photos by Leroy W. Demery, Jr and David Gleit. I really love these photographs. The contrast is so striking. I wish that bicycles were still a symbol of urban elitism and I also wish that the US would subsidize the buying of bicycles. Well in my hometown, I know three basic categories of riders – environmentalists (often in middle age and middle class commuters), working people with no cars (often Latino males on mountain bikes), and hipsters!! (middle class, artsy looking whites in their twenties and thirties with really fancy road bikes). 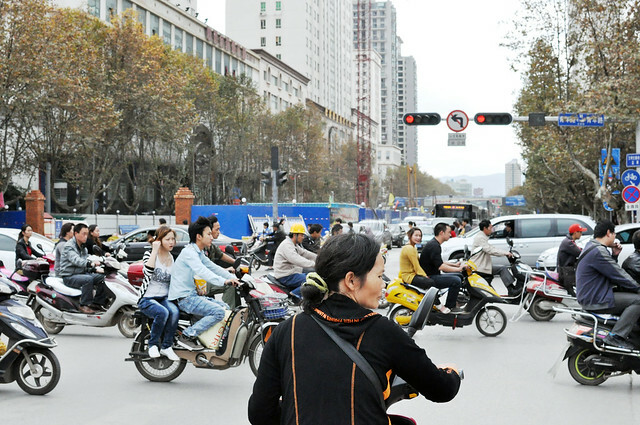 What are the demographics of bike riders in Kunming today? I see a lot of middle and high school students on new Giant bikes or trendy foldable bikes. But a lot of college students and young professionals prefer to ride electric bikes, scooters, or the bus. I’ve seen a few people around the university district with nice bikes, but it’s not too common in Kunming yet. A majority of the riders are middle aged and older with sturdy vintage bicycles (I wish I had one of those!). There are also these old wagon/bicycles designed to transport goods across the city, usually used by workers carrying cardboard scraps or branches. I think they’re really neat. I personally ride a very practical Chinese bicycle with a big basket for carrying groceries. It was one of the cheapest bicycles at the store, so I hardly ever worry about it getting stolen. If I ever have issues, the bike lanes here are lined with bicycle repair stations! Cool photos and some pretty serious food for thought for those advocating bicycles as viable car replacement. If I’m not mistaken the same thing is happening in India and probably many other places where economic prosperity makes riding a bike seem backward and lower status. That said the obvious comment is that further increasing the number of global cars on the road will only tend to drive fuel costs up for everyone, not to mention the increased environmental impacts. In theory this will accelerate the unsustainability of the car-as-primary-transport model. I guess we’ll just have to see where that takes us… But it’s hard to believe that bikes won’t make a global comeback. And hopefully in a good way, rather than a forced decision.